London region launch for Google Cloud Platform means customers can now run applications and store data with more flexibility than ever before. Google has boosted its UK cloud presence with the official opening of the company’s new London regional data centre. 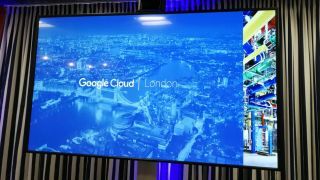 The London branch of Google Cloud Platform will allow businesses based in the UK and Europe to benefit from major savings in terms of infrastructure costs and efficiency, the company said at a launch event at its London headquarters today. “Google Cloud one of the most fastest growing and strategic arms of Google,” Sebastian Marotte, Google Cloud VP EMEA, said at the event. "But you don't drive...new business models if you don't have the infrastructure." London is Google Cloud Platform’s tenth region, joining Brussels to boost Google’s European presence - although the company said more launches will be coming soon, with Frankfurt earmarked for the next big launch. The launch will mean that Google Cloud customers in the UK will now be able to offload the running of apps outside of their business, as well as allowing them more flexibility on where their data is stored. Customers will now get a choice of three options when signing up to Google Cloud Platform, including a regional service, which runs applications and stores data in a specific region, multi-regional, where applications and storage are distributed across two or more cloud regions on a given continent, or global, where work is distributed across Google’s entire global network for optimal performance and redundancy. The launch also gained government approval, with the Secretary of State Digital, Culture, Media and Sport Karen Bradley, calling the news a “vote of confidence” in the UK technology scene. "We want to make sure that all businesses can take advantage of the benefits that digital brings (and) the only way we can benefit from this great technology is if people are able to use it."